← High on opinion but low on facts. The rounded mountain-top of Pumlumon in mid-Wales (more of a large hill, really, but still 2468 ft above sea level) is a recognised stopping off point for dotterel in the spring. In late April a single dotterel was reported on its summit so a couple of days later I decided to go for it. Leaving the house at lunch-time, I had reached the summit two hours later. I scoured and scanned for the bird but found nothing. Then there was a sudden movement on the ground three yards in front of me. There it was! What a gorgeous creature! I spent a happy hour photographing it in light winds and warm sunshine. It was nice to “share the moment” with Janet Baxter, who I had overtaken on the way up. And whose dog, fortunately, was more well-behaved than it sometimes is! I was back down in time to take my van to the garage by 5.30 pm, as planned. Sorted! It’s very unusual for an expedition like this to work out so successfully. I was happy, too, that I was able to reach the summit and return so quickly, Carrying just the one lens and camera body, a snack and bottle of water helped. Bearing in mind the image was taken in mid-afternoon on a cloudless day in late April, the sun was quite elevated. Contrast was therefore high and the shadows in the bird’s belly and chest were darker than I would have liked. Selecting this area with Lightroom’s radial filter and judicious use of the highlight and shadows sliders was quite successful in bringing this problem under control. 1. A single bird was seen and photographed on a Lake District hilltop while I was an RSPB warden in 1981. This was during my first era of bird photography. I gave one transparency to a local ornithologist with whom I was working. It later appeared under his own name in the Cumbrian Bird Report for that year. The same image later appeared in my book “Heart of the Country” (published in 2003) to accompany one of the late Bill Condry’s Guardian Country Diaries – in which he laments never having seen one! 2. 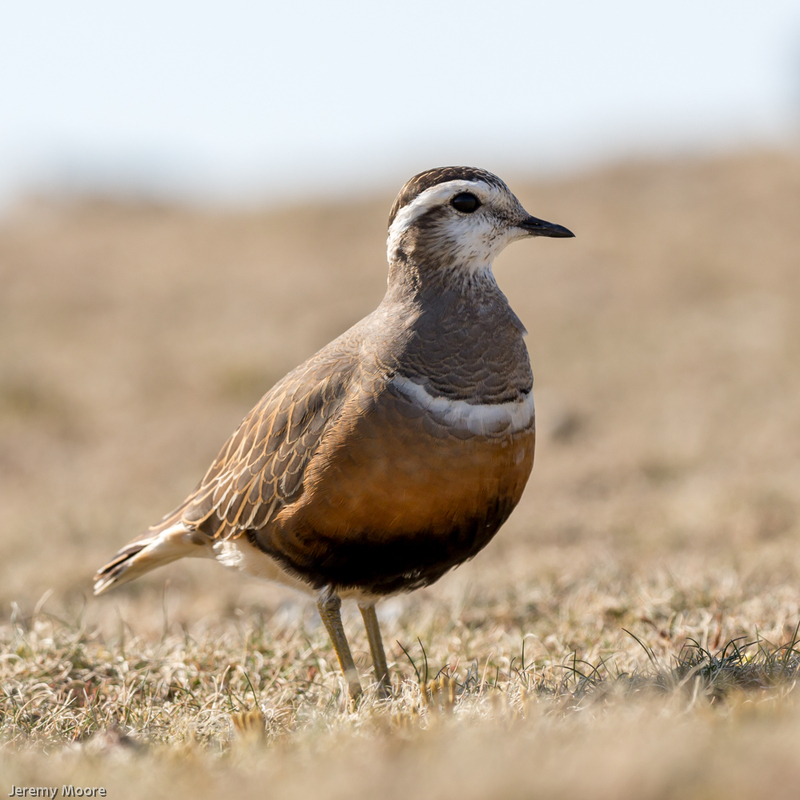 While working for the Nature Conservancy Council in Scotland in 1986 I spent a day – under licence – surveying a Grampian hilltop for breeding dotterel, with a group of friends and colleagues. During the survey I lifted a male dotterel off its nest with my finger. 3. A trip of dotterel seen on Foel Grach in the Carneddau (north Wales) in May 1987. 4. A trip seen on Pumlumon with a friend in May 1995. One bird was wearing coloured leg rings. From the combination of colours it was identified by the BTO: it had been ringed as a chick in Scotland 8 years previously and not seen since. 5. Three birds seen on a coastal field near Ynyslas in early May 2013. As I approached the field I met the farmer who was just leaving in his Land Rover. I asked him about the dotterel and he invited me to jump in: he would take me to see them. As we approached the birds they took off and flew strongly northwards, never to be seen again. So almost every dotterel sighting in my life has a story attached to it. Their lifestyle is extraordinary. The female is the more brightly coloured bird. She takes the male’s role and vice-versa. She lays a clutch of eggs for her mate to incubate, then travels further north to do the same for another male. I particularly like the thought that they migrate from hill top to hill top, stitching Europe’s mountains together as they go. This entry was posted in Uncategorized and tagged bird, Dotterel, photography, Pumlumon. Bookmark the permalink. Hi David! I’m sure using the adjustment brush is just as good for doing this sort of thing, possibly even better. The radial filter is limited to regular circular or oblong shapes but it’s still quite flexible, especially if you feather it to 100%. How did your dotterel pics go? I’d sure like to be able to photograph a group of them. Hi again. I’ve just tried using the adjustment brush on some black-necked grebes I found in France. Much easier than using the radial filter. Many thanks for your suggestion……. Funny you should mention photographing them in groups, Jerry. I was hoping to take some pictures this year with a wider view showing them together in one shot. The trouble is, at the time I only had my prime lens and t/c (420mm) so close-ups or as close as I could get them were the order of the day. The three of them were quite spread out, I believe a forth bird joined them later. I thought I’d get another chance over the next day or so with my 70 – 300mm lens but since then the weather on a whole has been dire and I haven’t been back up there. I suppose there’s still time for another group to land before we go away in just over a weeks time. If that doesn’t happen I’ll make it a priority next year, close-ups will come second! I intend to post a few pics before we head off up north so you should see them soon.